Baby, it’s hot outside! If you’re one of the lucky souls who has their own water garden, you can easily take advantage of its cooling magic during the dog days of summer. You can swim in a large pond (don’t worry, the fish won’t bite). And with a smaller pond, you can dangle your feet into its refreshing waters. A pond cools the air around it so if you’re like me and hate being cooped up on a summer day … no matter how hot … be sure to sit by your pond where the air is cooler. A patch of shade and a gentle breeze will simply add to the refreshment you’ll enjoy. Water gardens pull kids outside, away from the TV and video games. Mom and Dad get to spend relaxing time watching their children and catching up on the day’s events. This is so much better than reality TV! Even the family dog enjoys getting in on a little snorkeling action in the backyard pond. 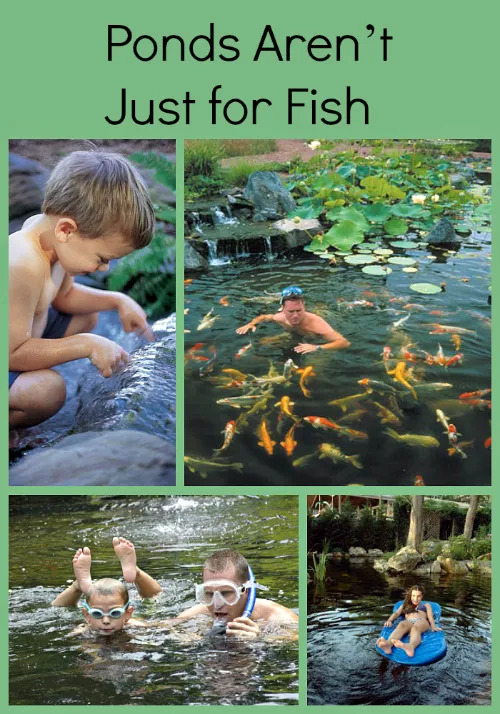 Sure, the kids could enjoy a pool … but they won’t be able to watch the koi swim underwater or search for tadpoles and watch them grow into frogs. Of course … snorkeling isn’t just for kids. Even dads like to get in on the action. What better way to spend a hot summer day with your kids? It’s like a vacation … in your own backyard! More snorkeling! Imagine all the great things he’s seeing at the bottom of this gravel-bottom stream. Mother Nature has lots of lessons just waiting to be learned. If snorkeling’s not your thing, maybe a lazy summer afternoon floating on a raft will suit your fancy. This photo was supplied by The Deck and Patio Company located in Huntington Station, NY (they installed the pond, too!). A waterfall without a pond (aka the Pondless Waterfall) creates a great spot for small children to get their feet wet. This Pondless Waterfall features a pebble beach with rounded stones for tender feet. It might be hard to coax her into the house for nap time though. Yes, this is a backyard pond. Beautiful plants and clean water transform you to another world … you’d never know you were actually in the suburbs of Chicago. 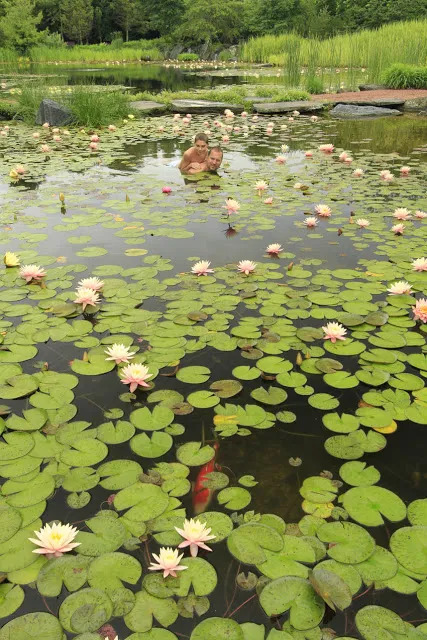 Checking out the waterlilies with dad … this is about as close to heaven on earth as you can get. Imagine swimming in clear water, surrounded by all types of beautiful koi. It just doesn’t get any better than this for exploring nature, up close and personal. A backyard water feature ensures that giggles of delight will replace complaints of summer heat and boredom. Water gardens are truly a unique way to unite the family and enjoy the splendor of our wonderful planet.